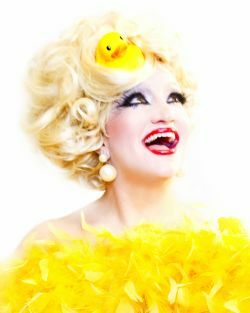 American Treasure Blanche DeBris is giddy to return once again to the Moisture Festival, her burlesque birthplace! Since debuting here in 2008, she has managed to not get herself kicked out of most of the shows and states she’s performed in. In fact, she has hosted the most prestigious international burlesque event, the Burlesque Hall of Fame’s “Tournament of Tease – Miss Exotic World” competition in 2013 and its “Movers, Shakers, Innovators” night in 2012 and 2014. Additionally, she has performed in or emceed such prestigious shows as the New Orleans Burlesque Festival Queen’s Ball, the Minneapolis Burlesque Festival, Kitty Nights West & The Taboo Revue (Vancouver), Windy City Burlesque Festival & The Tease (Chicago), Viva Dallas Burlesque, Victory Variety Hour & the Hollywood Burlesque Festival (Los Angeles), the Florida Burlesque Festival and the Las Vegas Burlesque Festival, as well as private and corporate events.